Menulog delivers for The Piano Restaurant & Bar so you'll be able to track your courier on a map. 1 x Pad Thai Chicken, 1 x Vegetarian Spring Roll (2 Pcs). 1 x Green Curry Chicken, 1 x Pad Thai Prawns, 1 x Rice, 1 x Roti. 1 x Slow Cooked Massaman Curry Lamb Shank, 1 x Pad Thai Prawns, 1 x Stir-Fried Cashew Nut Chicken, 1 x Green Curry Chicken, 2 x Rice, 2 x Roti. 8 x Vegetarian Spring Roll, 8 x Vegetarian Curry Puff, 8 x Thai Fish Cake, 1 x Stir-Fried Crispy Pork Belly with Gai Lan, 1 x Stir-Fried Thai Basil Beef, 1 x Slow Cooked Massaman Curry Lamb Shank, 1 x Green Curry Chicken, 1 x Pad Thai Prawns, 1 x Stir-Fried Cashew Nut Chicken, 2 x Coconut Rice, 2 x Roti, 2 x Rice. With traditional Thai spicy, chilli and lime juice. Homemade curry puffs with peas, sweet corn and sweet potato. Carrot, Chinese cabbage, mushroom and vermicelli noodles. Potato, peas, served with tamarind spicy sauce. Piano own recipe of Thai fish cake. Topped with crushed peanuts, sesame, caramelised sweet chilli and coriander. With tamarind spicy sauce and black pepper. Marinated chicken wing with Thai herbs and spicy sauce. Crumbed prawn served with sweet chilli sauce. Coated in flour, salt & pepper with Thai herbs, Thai siracha dressing. Grilled chicken. Served with peanut sauce and arjad dressing. Fried fish fillet with chips, salad, sauce and black pepper. Thai eggplant, green bean, red chilli and Thai basil. With potato, baby onion and roasted peanuts. Green bean, cherry tomatoes and lime leaves. 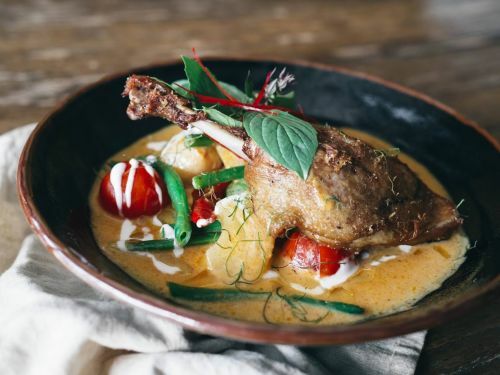 Slow cooked crispy duck leg confit with Lychee, cherry tomatoes, pineapple, long red chilli and Thai basil. In soy, ginger broth, spring onion, mushroom and baby corn. Served with fresh vegetables, fried chilli, spring onion and cashew nuts. Green bean, broccoli and Chinese broccoli. Slow cooked duck. Served with a spicy soy dressing and topped with crispy Thai basil. Chilies, green bean, garlic and Thai basil. With green bean, onion, red chilli and Thai Basil. Steamed in soy ginger broth, mushroom, fresh baby corn and spring onion. Chilli jam, Thai dressing and salad. With flat noodles, egg and Chinese broccoli. With roasted peanuts in a tamarind sauce. Shredded green papaya, carrot, tomato, green beans, peanuts, chilli and lime juice. Sweet and sour dressing. Chicken larb salad with Thai herbs mint, coriander, red onion and kaffir lime leaf and lime dressing. lemongrass, bean shoot and green bean. Coriander, lime leaf, lemongrass, red onion, coconut, cherry tomatoes and cashew nut bean shoot top with sesame. Carrot, lettuce, Thai basil, red onion, lime leave, lemongrass, coriander and mint. Mint, red onion, cucumber, cherry tomatoes, coriander, lime leaf and lemongrass. Marinated chicken, cucumber, lettuce and coriander. Mint, green papaya, cucumber, cherry tomatoes, red onion, coriander, lime leave and lemongrass.